Rwenzori Mountains (Uganda) (AFP) – In swirling snow, John Medenge prods a thin ice bridge over a crevasse with an iron-tipped spear, guiding climbers scaling the steep glacial wall using crampons and axes. “We are the last few who will climb on the ice, it is going so fast,” said Medenge, after scaling the treacherous ridge up Mount Stanley, part of the dramatic Rwenzori mountain range straddling the border between Uganda and Democratic Republic of Congo. At 5,109 metres (16,763 feet), Stanley’s jagged peak is the third highest mountain in Africa, topped only by Mount Kenya and Tanzania’s iconic Kilimanjaro. But experts warn the ice is melting at “disturbing” rates, and that within two decades Africa’s equatorial peaks will be bare rock, impacting agriculture and tourism. “Every year the ice grows smaller,” 54-year old Medenge added, who has been climbing the range since a teenager. Ancient Greek geographer Ptolemy in Alexandria wrote of the snow-capped Rwenzoris around the second century AD, dubbing the mysterious peaks the “Mountains of the Moon”, and identifying them as a source of the mighty White Nile. “The melting glaciers are another warning sign, a ‘canary in the mine’ of mankind’s inability to contain climate change and its negative consequences,” said Luc Hardy of Pax Arctica, an organisation that promotes awareness of the impact of climate change, and who led an expedition in January to the mountains. “The melting of this unique African glacier is a major threat to local communities, with the obvious loss of sustainable water supplies,” said Hardy, a French-American explorer and a vice-president of the environmental Green Cross group. Reduced glacial river flows are already impacting agricultural production and cutting the output of hydroelectric power plants, said Richard Atugonza, from the Mountain Resource Centre at Uganda’s Makere University. “It can be a big problem in the future for the region, with the river ecology already changing,” Atugonza said. Just a handful of kilometres (miles) north of the equator, the mist-covered Rwenzoris — meaning “rain-maker” in the local Bakonzo language — stretch for some thousand kilometres squared (386 square miles), and include several short glaciers, though on many peaks remaining ice is now tiny patches. Fifty years ago, the glacier once began a stone’s throw from the cliff-top Elena camp, where mountaineers shiver in basic huts before making a pre-dawn attempt to scale Stanley’s peaks. Now the ice lies almost an hour’s tough scramble up a steep track on loose rocks along sheer cliffs. 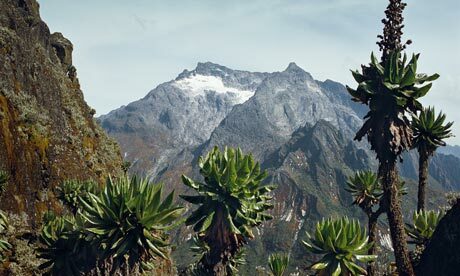 “Global warming was not caused by people here, but it is harming us,” Baluku Stanley said, chairman of one of the main trekking companies, the community-run Rwenzori Mountaineering Services. “Of course when the ice goes it will affect tourism, even though trekking in the valleys is amazing,” he added. Spectacular valleys with fantastical vegetation akin to a fairy story — including bizarre twisted trees draped in near luminous green lichen, giant lobelia plants and heather some five metres (15 feet) tall — offer extraordinary trekking, even once the ice has gone. “The Rwenzoris are some of the most exciting glacier trekking and climbing I’ve done, rivalling peaks in Europe and South America,” said Paul Drawbridge, a keen British mountaineer on an eight-day expedition to climb Stanley.